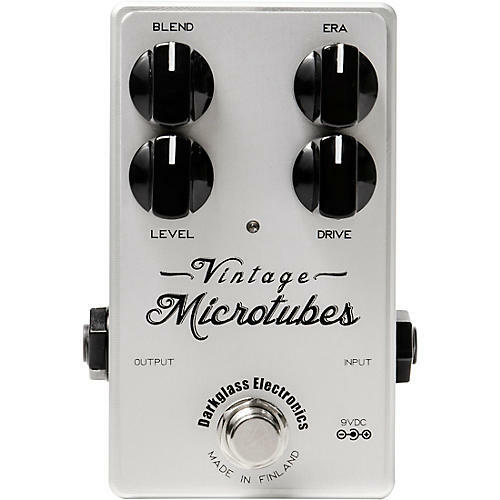 The Microtubes Vintage is Darkglass' tribute to some of the most legendary sounds in rock history. It provides warm tube-like tones with a natural dynamic response that echoes the organic compression of old tube amps and reel-to-reel tape machines. Era: Interacts with the Drive knob to shape the character of the pedal. Dial it down to get the warm midrange tones of the '70s or crank it up to get the punchy metallic tones of '80s and '90s rock. WARNING: The Vintage Microtubes has a current draw of 20mA. Only use a regulated 9V DC adapter with a center-negative plug. Due to ecological reasons it does not accept batteries. Unregulated power supplies and/or higher voltages may result in suboptimal noise performance and even damage your unit, voiding the warranty.